Introducing a Scientific Breakthrough that Gives Babies Less to Cry About! Gerber® Good Start® Soothe formula is the first and only routine infant formula to have L. reuteri, a probiotic that has been clinically shown to reduce crying time by up to 50 percent in colicky breastfed babies in as little as one week.1,2 It offers a new solution for parents who choose formula. 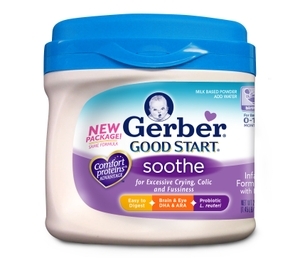 Gerber® Good Start® Soothe formula is available nationwide. * Suggested retail price for the 12.4 ounce powder is $15.00-15.50 and for the 23.3 ounce size, it is $23.50-24.00. 1. Savino F et al. Lactobacillus reuteri DSM 17 938 in infantile colic: a randomized, double-blind, placebo-controlled trial. Pediatrics. 2010;126:e526-e533. Collection Strain 55730) versus simethicone in the treatment of infantile colic: a prospective randomized study. Pediatrics. 2007;119:e124-e130. 3. Rudolph’s Fundamentals of Pediatrics. 3rd Edition. 2002. 4. Savino F et al. Intestinal microflora in breastfed colicky and non-colicky infants. Acta Paediatr. 2004;93:825-829.